I would only say that every child and every school is different. Each parent has to make the right decision for their family. I happen to know the blogger (hi Sandy), her son was in the same orphanage as my two older kids. We ASKED that our son be placed in fifth grade when he came home at 12 years old so that he had time to catch up with his language and learn the ropes. He is now in 7th grade and 15 years old. He gets all A's in a very academically rigorous public school, receives ESOL services - 2 english classes one being academic english and one in history. The rest are general ed classes. We are very lucky to be where we are as far as school systems go. He is thriving and happy. 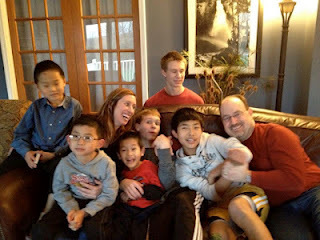 We adopted another older child at the same time, who did not have the academic background our son did. So she is further behind academically, but flourishing in public school. Again our school system bent over backwards to accommodate our children's needs. Not that they understood all that older international adoption and trauma means to these kids - but I was there to educate them. I know the school systems in all parts of the US are not as progressive or accommodating, but I would encourage those who don't want to/can't home school or place your children in private schools to research and try to work with your public school. You may be pleasantly surprised. I feel like OUR public school is better equipped to meet the needs of our IA kids than a private school would be. You will find as many different answers to what grade to place and where to educate as there are families out there. Do what feels right for your family and your child. Thanks Sandi! My adopted son is much younger, and I already was a homeschooler so we haven't had to work with a public school at this point. But I suspected (and you just confirmed) that many parents have found public school situations that work for their older adopted kids. Thanks for taking the time to comment. WOW, this post made me "crazy", too! I can't believe the public school's approach to this child. Good for you for not giving up! Knowledge of additional languages apart from the mother tongue helps acquiring better knowledge about history, culture and different technologies used in the different parts of world. Therefore, it will be a wise step to join the online language learning classes.